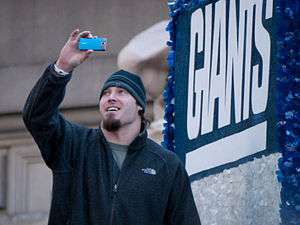 Blackburn at a parade celebrating the Giants' victory in Super Bowl XLVI. Chase Wyatt Blackburn (born June 10, 1983) is a former American football linebacker and currently a special teams assistant for the Carolina Panthers of the National Football League (NFL). He was signed by the New York Giants as an undrafted free agent in 2005. He won two Super Bowl titles with the Giants, both against the New England Patriots. He played college football at Akron. Blackburn attended Marysville High School in Marysville, Ohio and was a letterman in football and basketball. In football, as a senior, he led his team to a 13–1 record and the 2001 Ohio High School Football Division II State Seminifinals. He finished with 320 career tackles. Blackburn was a three-year starter at the University of Akron, playing both linebacker and defensive end. He started 34 of 45 games in which he played and finished his college career with 293 tackles (179 solo), 11 sacks, 38.5 tackles for losses and three interceptions. He started all 11 games as a senior and finished with 71 tackles (41 solo), 5 sacks and 8.5 tackles for losses playing the "bandit" – a hybrid between the linebacker and defensive end positions. He was named All-MAC linebacker as a junior. Blackburn measured 6'3" and 245 pounds. At the Akron Pro Day, Blackburn ran a 4.69 40-yard dash. 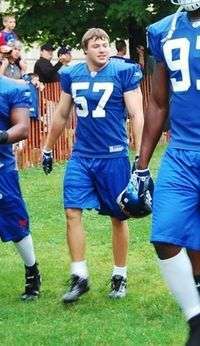 Blackburn at Giants training camp in 2007. An undrafted rookie for the New York Giants in 2005, Blackburn spent most of the season as a backup linebacker and special teamer. In Super Bowl XLII Blackburn had a costly penalty on a punt return as he was the extra man on the field on a 12-man-on-the-field penalty. After the play, New England Patriots head coach Bill Belichick challenged the play that the Giants had 12 men on the field and won. The penalty resulted in a first down, but the Patriots did not score on that drive after a failed 4th down conversion. As a result, the Giants improved their field position by 20 yards, so the penalty actually benefited the team. The Giants went on to win the game. For 2010, he was elected as a team captain by his teammates, representing special teams. After the season, he became an unrestricted free agent. He was re-signed on November 29, 2011. In Week 13 in a game against the Packers, Blackburn recorded an interception against Aaron Rodgers in his own end. In the fourth quarter of Super Bowl XLVI, Blackburn recorded an interception against Patriots quarterback Tom Brady, the lone turnover of the game. The play was vital to winning the Super Bowl. He also had six tackles. Blackburn agreed to a two-year contract with the Carolina Panthers on March 27, 2013. Blackburn played a part in Carolina's defense in 2013, complementing Thomas Davis and Luke Kuechly with 33 tackles and 2 stuffs in the regular season and playoffs. On March 10, 2015 Blackburn became a free agent. During the off season before the 2016 season, Blackburn was brought in as a special teams coaching intern. Then on August 14, 2016, Blackburn was promoted to the special teams assistant to special teams coordinator Thomas McGaughey. Blackburn and his wife Megan have two sons, Landyn and Bentley and had their third son in September 2013. He graduated from the University of Akron with a degree in mathematics. He lives in Dublin, Ohio. Blackburn is a Christian. ↑ Wesseling, Chris (March 27, 2013). "Chase Blackburn tweets he's joining Carolina Panthers". NFL.com. Retrieved 2013-03-27. ↑ Henson, Max (June 9, 2016). "Blackburn chases coaching career". Retrieved August 14, 2016. ↑ Henson, Max (August 14, 2016). "DeHaven named senior advisor to special teams". Retrieved August 14, 2016. ↑ Blackburn's profile at New York Giants website Archived April 15, 2009, at the Wayback Machine. ↑ "Serby's Sunday Q & A with… Chase Blackburn". ↑ "Unpackin' It: Two-time Super Bowl champion Chase Blackburn talks about faith, family and football".